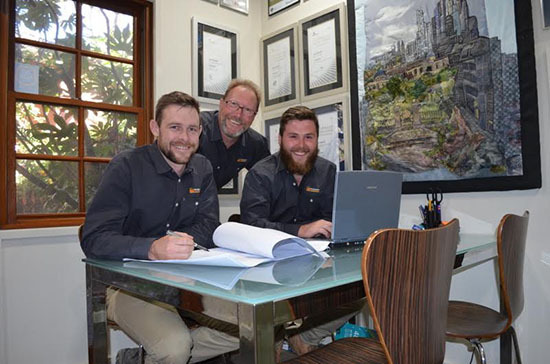 The culture at Pichelmann Custom Building has been carefully cultivated over the last twelve years to ensure our team is focussed on the highest levels of quality and service - the hallmark of our business being a culture of honesty and transparency felt by our clients and our staff. We’re proud to say we’ve built a positive on-going relationship with all our clients, past and present which speaks to our service delivery. We pride ourselves on this achievement – building our reputation is as important to us and building your home. Parry has 37 years’ experience in the building industry with over 20 years of that experience being in project management. Canberra born and bred, Parry began his plumbing apprenticeship in the Australian army and in 1985 he represented Australia in the Plumbing International Skill Olympics. Whilst representing Australia in Plumbing at the 1985 Skill Olympics in Japan he met Meike Laubvogel who was Germany’s plumbing competitor. They have been together ever since. From 1987 – 1991 Parry was the Australian chief judge and designer, International Skill Olympics – Plumbing. Meike has 37 years’ experience in the building industry with 12 years’ experience in Business Management and Accounting. Born in Hamburg, Germany, Meike always wanted to be a part of her Father’s plumbing business. With an excellent eye for detail and classic German diligence, she developed her skills soon becoming one of Germany’s finest tradespeople…. Her biggest challenge, however has been keeping Parry in line throughout their 28 years of Marriage. In 1985, Meike represented Germany in plumbing at the International Skill Olympics. Eugene has 15 years industry experience. Canberra born and bred, Eugene began his career with Pichelmann Custom Building as an apprentice. He then went on to establish his own business as a carpenter and builder whilst continuing to work alongside the Pichelmann team. We’re very pleased that Eugene has returned to Pichelmann Custom building full-time as a Director. Eugene can often be seen running around town for Canberra Royals Rugby of a weekend or chasing fish all over the country. Tom has nine years’ industry experience. 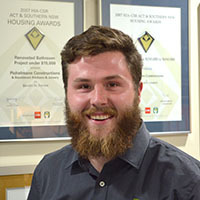 Tom grew up in Wamboin on the outskirts of Canberra, before starting an Apprenticeship with Pichelmann Custom Building under the guidance of Telly and Eugene. Upon completion he started his own Carpentry business, before later joining the team as a Director. Tom’s love of fishing is matched only by his love of spear fishing. With a commitment to excellence in building, Pichelmann Custom Building Services takes great pride in providing the very best quality services to all of our customers. Whether our home builders are working on a large new-build project, a small renovation job, or are tackling a heritage project, we’ll always give the same care and attention over to our work. Over the years, we’ve built up a reliable reputation within the building trade for delivering a high standard of service and quality bespoke building work. As a result, we’re delighted to have won a variety of awards from bodies including the Housing Industry Association and the Master Builders Association. We also previously won in the ACT Sustainable Cities Awards. We believe that our work speaks for itself in terms of quality, and are very happy to have these awards to back this up. When you come to Pichelmann Custom Building Services, you can therefore always expect an incredibly high standard from an experienced team of builders who do a superior job each and every time.